I cringe whenever I think back to the times before I became a Lutheran when I recorded a podcast and ALWAYS ended each broadcast with some variation of the un-Biblical and so-called "Sinner's Prayer" or implored listeners to "Choose God!" if not also "Choose Him And His Ways!" more often if they were already Christians. Lord, have mercy! Please forgive me! It was nothing but pure false teaching I was perpetuating under the guise of "good intentions" and a "passionate pursuit of the truth" and even though I didn't know any better at the time that's still no excuse for my sin. Thankfully, some complete strangers cared enough to call me out on it, I repented, and here we are, thanks be to God! Anyway, I thought about all of that again the other day when I read an excellent sermon from Concordia Lutheran Theological Seminary's blog (the very institution I hope to be admitted to one day, God willing). In just 5 simple verses we learn about Jesus calling Matthew. As usual, however, nothing is ever "simple" when it comes to God's Word! This sentence struck me already as a child when I followed the adventures of Shasta and Aravis, and it resurfaced now as I read the Gospel lesson for this day of St Matthew. For sometimes I am struck not only by what is said in the Scripture, but also what is left unsaid. The calling of Matthew the tax collector is only briefly told, and almost nothing is explained. What was Matthew’s background? Why had he chosen a rather despicable profession of a tax collector? Was he happy? Was he sad? Did he have a guilty conscience? And what went through his head when he heard the words of Christ: “Follow me.” What made him decide to follow Jesus? What did he hope to find with Christ? Scripture is silent, which is even more surprising if we think that the Matthew who is now called is also the evangelist who later writes these words. He of all people should be able to give answers, but he does not do so. No one is told any story but their own. This seems to be a prevailing theme throughout the many encounters the gospels tell us. Scripture focuses on what was said and what happened then, but very rarely if ever do we get even as much as a faint glimpse into the inner thoughts and experiences of people called by Christ. The question, “What did it feel like?”, so often asked today in interviews and ‘human interest articles’, is left out. Why? I offer you three possible reasons. Firstly, what happens in the soul of a man when God’s Holy Spirit enters, bringing light into the darkness, is a mysterious, even delicate event. These are great and wonderful things, but also very personal and intimate, not meant to be shared simply to satisfy the curiosity of others or. Martin Luther, known for his robust language but also capable of beautiful expressions, spoke of God’s law as a maid who leads the bride to her groom, but once the two, Christ and the believer, enter the wedding chamber of the gospel to spend their night together, the maid must remain outside. It is not for the eyes of the others. And here we really encounter the limits of our language – should one try to explain the miracle of personal conversion, it seems almost unavoidable that every expression would just make it more banal and mundane. Secondly, the silence in these matters might be guarding us, the readers, against the error of imitation. How often it has happened, that when joyful conversion stories are shared in detail with others, especially those young in faith, the joy is mixed with the feeling of uncertainty or even insufficiency. Why didn’t it go like that with me? Why didn’t I feel that way, why didn’t I go through that phase, why didn’t God address me and my soul in that manner? Is there something wrong with me, is my conversion lacking? Such is our nature that we compare and imitate, and through comparing and imitating either feel proud or insufficient. So the Scriptures might be silent just for this reason – to keep us from doing what we so naturally would do when confronted with detailed descriptions of other people’s religious experiences. The focus point in the gospel is not Matthew. It is the powerful call of Jesus Christ. The healing of the paralytic is paired with the calling of Matthew to show how Christ’s word raises both men up from their sickness. For the first man, it was very visible and bodily sickness, for the second, a sickness of spirit, the paralysis of Matthew’s heart and mind and soul. Through his word, Jesus reaches out, not touching lame legs or blind eyes this time, but grabbing the tax collector dead in his sins and giving him new life. The brevity of this story puts the focus on Jesus and his call. It is not what happens in Matthew’s hear that really matters; it is what happened in Christ’s heart that saved him. Calling of Matthew led immediately to a meal together with Jesus. Again, not much is told of the people who came, the focus is solely on Jesus. All we really know of them is that on this meal the Holy one of God ate and drank with ‘many tax collectors and sinners’. This is the kind of people he came to call – not the righteous (or those who imagine themselves to be so) but sinners. With Jesus, they, the moral rabble, are taken into the mysterious, glorious tradition of God eating with humans. The promise of the seed that would come to be a blessing to all nations was given to Abraham over a meal. It was a sacred meal that God instituted as a sign of his people’s freedom from the slavery of Egypt. On Sinai the elders of Israel celebrated the covenant by eating and drinking on the mountaintop as they saw God. And the feast on the Holy Mountain of Zion is the image Isaiah uses to describe the ultimate salvation of mankind. Throughout the history of God’s people, their Saviour has sat down to eat with them, and here he is, in the man Jesus, eating and drinking with sinners. If only Jesus would call me and you in likewise manner! If only he would come and ask us to similarly dine with him! But he has. And he does. Even today through his word he says again, his words always fresh and new: I have come to call sinners. He says to you: Follow me! He sits down to eat and drink with you, saying: Eat! This is my body, given for you. Drink! This is my blood, shed for the forgiveness of your sins. Those who have no sin, don’t need to bother. But all those who are sinners, sick and dying, paralysed in their hearts and spirits, come! Let me feed you, forgive you, heal you he says. No one is told any story but their own. But with Christ, his story becomes our story. We become part of the story of his people. And so we too are taken into the same table with Abraham, Isaiah and the elders of Israel, the disciples and Matthew as we eat and drink the meal of salvation, forgiveness and healing. Of course, as is usually the case whenever I come across something I like (and because I'm still relatively new to how the Lutheran church regularly celebrates certain "Feast Days" or "Festivals" like this one), I began to search for more distinctly Lutheran material on this passage. It is God’s mercy, not His holiness that makes it possible for men to approach Him and even sit and eat and drink in His presence. And it is this characteristic of God that Jesus demonstrated by eating and drinking with tax collectors and other sinners, as we heard in the Gospel. It was His merciful attitude toward those who were lacking in personal merit that both attracted unholy sinners to Him and shocked the holier-than-thou Pharisees. Among these unholy sinners with whom Jesus associated was Matthew. As we heard in the Gospel: “As Jesus passed on from there, He saw a man named Matthew sitting at the tax office.” Matthew’s self-description is less than flattering. If we were to leave our imprint upon a document that we knew would be viewed by many people, we would not hesitate to describe ourselves in the best possible light. Not Matthew though. In telling the story of his own call by Jesus, Matthew is brutally honest about himself. He makes it known to every generation who reads the Gospel which bears his name what kind of person he was when Jesus found him—a tax collector, a sinner. The call to repentance issued by Jesus is not a call to a higher morality, or a call to try harder to obey the Law. If anything, the call to repentance is above all a call to give up on self, and follow Jesus who is a friend to sinners. Followers of Jesus find in Him not another set of demands but a righteousness that is given to them from above, as a gift. In addition, and in short, "His words, which are essentially the words of Jesus, invite you and I to give up on ourselves, to stop trying to justify ourselves by our own efforts, confess our lack of holiness and to follow Jesus, who has mercy on the poor in spirit, and sacrifices his life for the sake of his enemies." Amen! We praise God for the Evangelist that gave us, among other things, the full revelation of God’s name as Father, Son, and Holy Spirit. It is Matthew to whom we are indebted for the institution of Holy Baptism, and the story of Jesus’ escape from Herod and the visit of the Magi. From Matthew’s pen we learn that Jesus is not only the King of the Jews, but also Emmanuel, God with us. The other Gospels give detailed accounts of the suffering, death, and resurrection of Jesus, but Matthew’s Gospel is unique in explaining the Lord’s Supper and Jesus’ death in terms of the forgiveness of sins. From Matthew we learn that Jesus is the promised Messiah, that though he is flesh and blood his true origins are in God. Matthew includes Jesus’ teaching on the Law, the Sacrament of Holy Baptism, Prayer, Confession, and the Sacrament of the Altar, which may explain why Matthew has occupied a place of honor in the church since the beginning. This, then, is the greatest miracle of all, not that Jesus makes us better people, but that in Him, in His crucified and risen flesh, our heavenly Father declares us unholy sinners to be righteous in His sight through faith. It was for this message that St. Matthew lived and died, and it is by that message that we are saved. Personally, I thought that was fascinating. I hope you did as well. There's still a little more I'd like to share though! There is no clearer expression of the Gospel and no more concise explanation of the conflict between true and false religion than is found in these five simple verses from Matthew’s Gospel. Jesus calls a sinful man to follow him. People who do not see their own sinfulness complain about this. Jesus rebukes them with Scripture and explains His mission to forgive sinners. He also points out that our role as forgiven sinners is to be merciful in response, rather than to depend on our own sacrifices. St. Matthew uses his own situation as not only a kind of sermon illustration, but as a summary of the Gospel and as a means to summarize the entire message of Jesus to the believer and unbeliever alike in this short passage. And this, dear friends, is the work of the Holy Spirit, inspiring the Evangelist to take up his pen and leave this Gospel as a written testimony that will endure until the Lord returns. St. Matthew doesn’t waste a lot of ink explaining the nature of his call to become a disciple. Jesus called him. He followed. The tax collector left his booth, left his job, left his former occupation of greed – left it all – to be a disciple of Jesus. Our blessed Lord said: “Follow me,” and “so he arose and followed Him.” Matthew has nothing to say about himself other than that he followed. Matthew doesn’t give any testimony about himself – but rather testifies to the words and deeds of our Lord. In fact, Matthew groups himself with the “sinners and tax collectors” sitting at the table with Jesus – a fact that upsets the Pharisees. Far from painting a virtuous picture of himself, Matthew shows that he is a castoff, a pariah to the movers and shakers of society. Matthew is a filthy tax collector. He says it matter-of-factly, not in order to teach us about himself, but rather to teach us about Jesus. 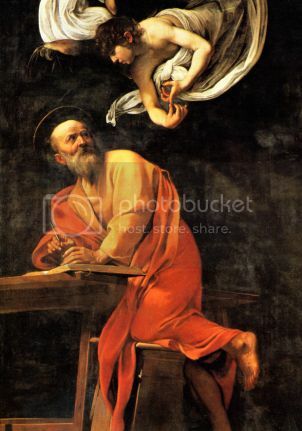 St. Matthew is an Evangelist, one of four charged with inscripturating the life story of our Blessed Lord. He is a minister of Jesus Christ. He is a preacher of the Gospel. He is not a showman or a charlatan. He is not an entertainer or an inspirational speaker. Rather he is a sinner, a filthy tax collector, a cause of shame to Jesus in the eyes of the world. And this is whom God chose to write the first Gospel. Notice, it isn’t about Matthew. It never has been about Matthew. Matthew is the messenger, but the message points to the Messiah. For St. Matthew doesn’t speak his own words, but the very Word of God from the lips of the Lord with whom St. Matthew ate at table. Our Lord sums up His messianic mission very simply: “Only the sick need a doctor.” In other words, Jesus has come for sinners and sinners only. If you believe you don’t need a Savior, then you don’t need Jesus. For there is nothing a doctor can do for a patient who believes he is not sick. It is only in acknowledging our frailty and our weakness, our infirmity and our desolation, our filthiness and helplessness that the Great Physician can bring us a cure. Those who refuse to accept that they too suffer from the terminal disease of life in this fallen world will simply perish with the cure looking them right in the face. And this was indeed St. Matthew’s calling and purpose in this life. St. Matthew’s Gospel, according to tradition, was carried by St. Bartholomew to India. Matthew’s Gospel was translated from Hebrew to Greek, was universally recognized by the Church as the very first book of the New Testament, and is today found in Bibles and New Testaments in churches, in hotel rooms, in the pockets of soldiers, on college campuses, in grade schools, in the homes of believers and unbelievers alike. St. Matthew continued to testify of his Lord and Master nearly 2,000 years later, and in every imaginable language. The Word of God is there for all. It pulls no punches. It has no secret hidden codes. The meaning hasn’t changed in two millennia. There is no riddle to solve and no puzzle to work out. St. Matthew simply reports what our Lord says: the simple fact that He is the Great Physician, and physicians come for the sick. Jesus has come into the world to save sinners. So, who could have an issue with that? Only people who do not perceive themselves as sinners. For them, the Kingdom of God is an exclusive place that they have earned by clawing and scratching, by sacrificing, and by working. And along comes Jesus with His throng of misfits: drunks, whores, thieves, crooks, even a terrorist. Later, one of Jesus’s preachers whose works will find their way into Scripture will be a guy who used to try to snuff out the Christian faith, who wrote: “And to the one who does not work but trusts Him who justifies the ungodly, his faith is counted as righteousness.” But where does this leave all the work and the sacrifice of the clawing and scratching Pharisees? Well, our Lord tells them: “go and learn what this means: ‘I desire mercy and not sacrifice.” In other words, Jesus has just told them their work is useless and their sacrifice is in vain. For Jesus is the sacrifice. Their work is to be merciful. This is indeed the work of forgiven sinners. Any sacrifice we make is one of thanksgiving, not for the forgiveness of sins. Any work that we do is not for credit, but simply because it needs done. And when we do repent, when we do struggle against evil, when we do manage to do good works for the sake of the Kingdom, we don’t get one step closer to redemption – for redemption is already ours. The Physician has come for us, for the sick, for the tax collectors and sinners – not for those who would justify themselves. Praise, Lord, for him whose Gospel Your human life declared. Who worldly gain forsaking, Your path of suff’ring shared. In a Lutheran layman's terms, the Word of God "is living and active, sharper than any two-edged sword, piercing to the division of soul and of spirit, of joints and of marrow, and discerning the thoughts and intentions of the heart" (Hebrews 4:12), and the healing of the paralytic is paired with the very few words that describe the calling of Matthew to show how Christ's Word raises both men up from their sickness just as it has raised us up from ours. Nice post and some great sermons! "St. Matthew’s Gospel, according to tradition, was carried by St. Bartholomew to India. Matthew’s Gospel was translated from Hebrew to Greek..."